On this hot summer day, I could do with some hail right now. In the Sacramento valley, snow is a rare occurrence since we are at sea level. Hail is the closest thing to snow here. Not that I like it, but when it falls this thickly, we can pretend to make a snowball or a miniature snowman. 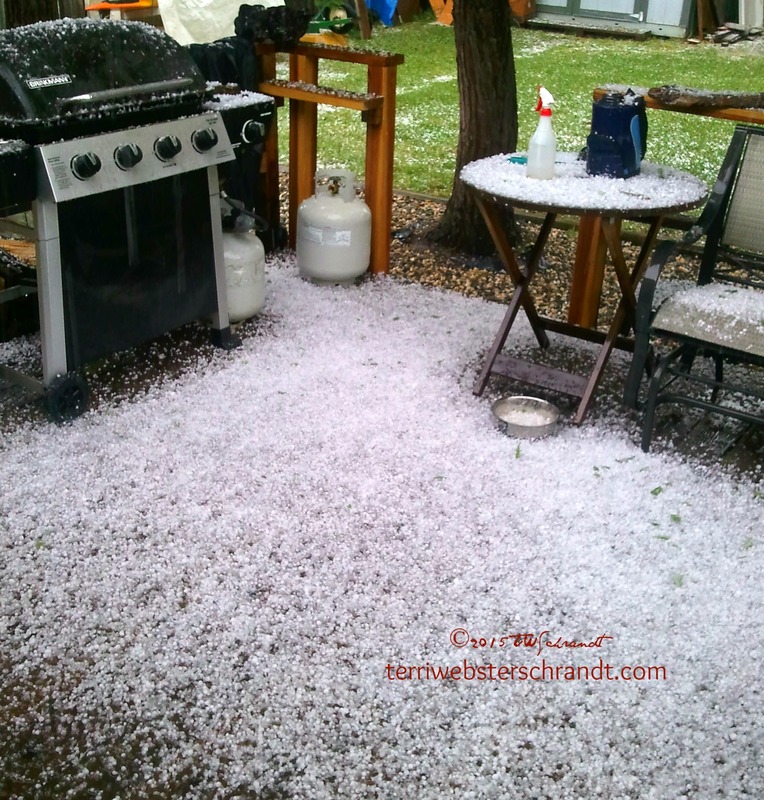 This photo shows how thickly the hail fell on my backyard deck in late spring. Hail looks like snow on my deck…in May! 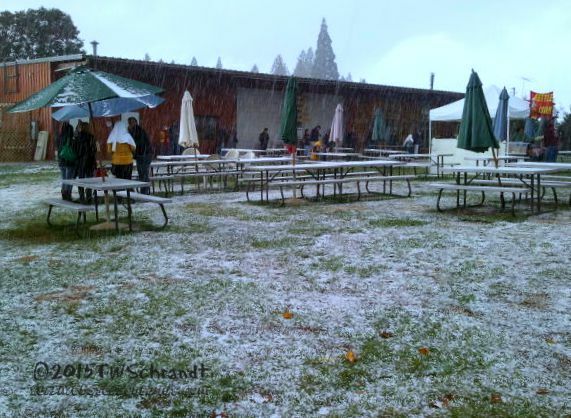 In this photo, a late October hail storm hit us while at Apple Hill in the Sierra Foothills. When we left the house that morning, it was sunny and warm. By the time we got here, 35 miles away, we were greeted with cold, drizzly conditions. This hail storm happened in the afternoon while we visited the Jack Russell Brewery. Apple Hill’s Jack Russell Brewery. Hail is the theme for this week’s One Word Photo Challenge hosted by talented photographer Jennifer Nichole Wells. Good thing you take so many pix, so you can have already one on file for the challenges! Those hail pix are crazy! A sea of hail indeed! Those pictures are wild. Thank you! Now how did you know that I went for a warm drinky-poo? I had no idea you get hail- love the photos! Wow Terri – that’s some full-on carpets of hail you have there. How amazing. Hope nothing gets damaged too badly. I’m so drawn to your first image. I’ve never seen such thick covering of hail. The weather is strange this week all over but the hail added much needed moisture. My blog this week should help cool you down. Waterfall. WordPress is again changing items and wouldn’t let add all I wanted. The smoke from the Idaho’s is so bad masks have been passed out. You guys have had hot weather too! I heard about those fires. Some of the smoke has made its way to Nor Cal so the air quality is bad. At least our normal 92 degree afternoon heat feels better now that the delta breeze is back. Be careful out there, Betty Louise! Interesting to see several bloggers are writing about enough already! with the summer’s heat. We had fried gardens last week but received an inch of rain and cooler temps today. I guess we’ll boggle along for awhile. So sorry for the drought in California! This has been one really HOT summer in the west. We traveled to Washington state and San Diego and temps were 100 degrees! Heading to Portland OR next week and temps there have been breaking records at 103. I sure hope the predictions about El Nino bringing us rain this winter are true. Enjoy your cool temps, Janet!